Headline inflation came in above expectations at 3.8% year on year, reaching an almost six-year high level in October 2018. The importance of this reading is that it is well above the central bank's expectation of 3.3%. In the past three months, inflation overshot the National Bank of Hungary's forecast by 0.23ppt on average. It suggests that the central bank might need to revise its inflation forecast upwards in December. However, one thing can derail this momentum, i.e., if the European Commission and the ECB both downgrade the Eurozone's economic and inflation outlook. This will also impact the NBH’s view on the local growth story and imported inflation going forward with clear downside risk. 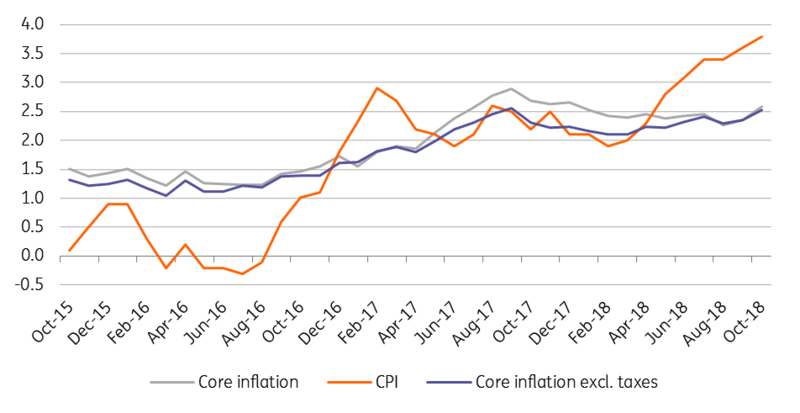 The bottom line is, the recent reading won’t trigger a prompt change in the monetary policy, as core inflation stands at 2.6% YoY, and despite the fact that it is showing a 0.2ppt acceleration compared to September. The uptick in the core inflation is driven by two things. Firstly, the inflation in services is slowly but surely increasing, reaching 1.9% YoY rate in October, which is still subdued, however. 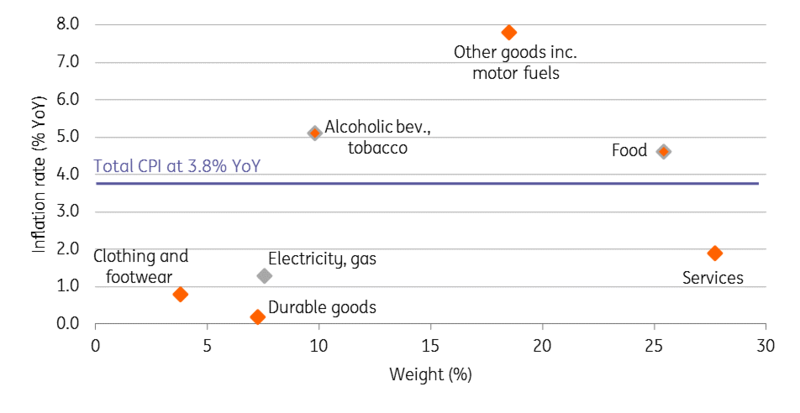 The surprise of the October reading mainly came from the durables, where the 0.2% YoY inflation is the highest since Sep-16. It seems that the weakening of the HUF didn't go unnoticed. Core inflation also increased on tobacco prices due to the excuse duty change introduced in September. On the non-core side, the usual suspects drove the inflation: fuel and seasonal food prices increased by 16.2% YoY and 20.5% YoY, respectively. In our view, today’s data won’t trigger any prompt move by the central bank. However, it is definitely likely to raise some eyebrows as the NBH’s underlying inflationary measures has also been ticking higher recently. The central bank is releasing its new Inflation Report in December along with its forward guidance, whereas the hawkish shift could come from moving the target date for reaching the inflation in a sustainable manner forward by one quarter from the recent mid-2019 target. But again, the NBH can easily look through the recent uptick if the external environment shows signs of prolonged deterioration.